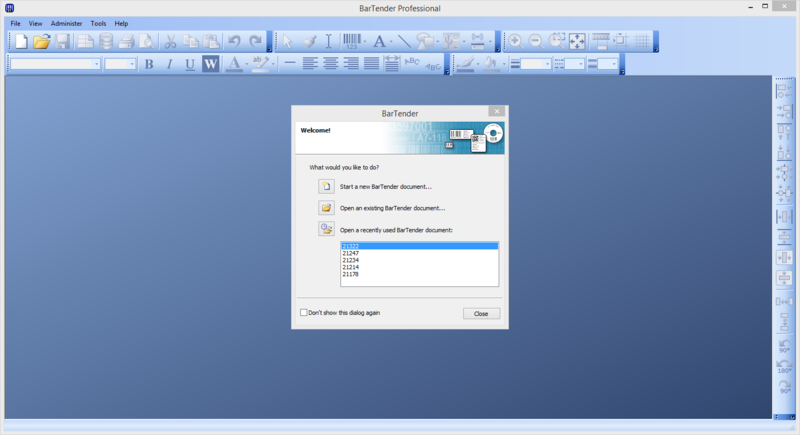 This article will explain how to setup and utilize the Bartender software to print and encode RFID tags. In order to use Bartender for your RFID printers, you will need to replace the printer's current driver with the Bartender driver, which can be downloaded from Seagull Scientific's website (linked above). 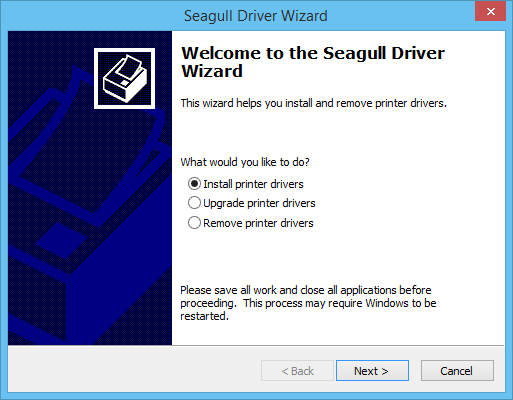 Once the Bartender drive has been downloaded, open the executable file that comes with the download, which should open the Seagull Driver Wizard. Select 'Install printer drivers' and 'Next'. On the next screen, select 'Other' if your device is not recognized by the USB search. Be sure to connect the printer to the PC at this time and turn on the printer, and select 'Next'. On the next screen, select the manufacturer and model of the printer that you are using and select 'Next' to continue to the next page. Select a Virtual Printer Port for USB, which should be represent by "USB001" or a similar name. Once this is done, continue to the next page where the printer can be renamed if desired. Finally, on the next screen, select 'Finish' to complete the driver installation. If the above steps resulted in an error or the Driver Wizard was unsuccessful installing the driver, the printer's default driver may need to be removed before the Bartender driver can be installed. Once the Bartender driver has been downloaded, you will need to remove the printer's default driver by navigating to Devices and Printers in the Control Panel, selecting the printer, and selecting the 'Remove Device' option. Once this is done, unplug the printer's USB cable from your PC and plug it back in. When the default driver attempts to automatically install, select 'Cancel' and run the Bartender Driver Wizard instead. This should automatically detect your printer and install the driver. If this does not happen, follow the steps in Setting Up Your Printer for Bartender again. Now that the drivers have been installed, launch Bartender to start creating a printing template. For assistance in setting up your printer to print RFID tags, please see our articles on printer setup below. Once BarTender launches, select the option to 'Start a new BarTender document' and navigate through the New Document Wizard interface. 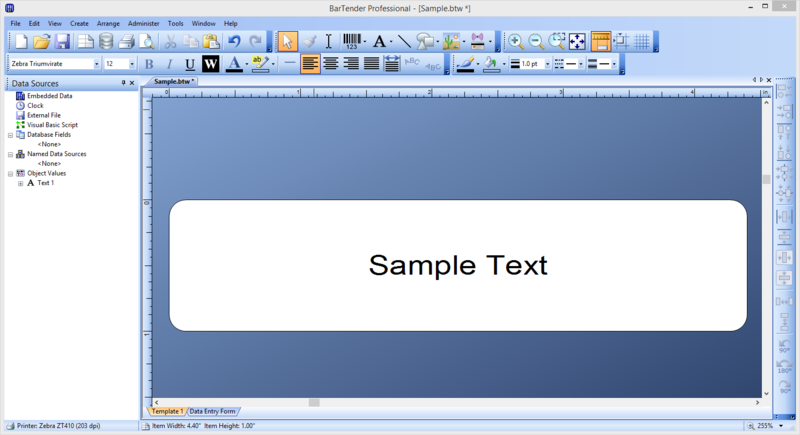 Select 'Blank Template' and the printer that you set up to use with BarTender. Select a specific label stock from the list on the next page or continue to a custom stock design. If choosing a custom stock design, fill out the information regarding the number of labels to be printer per page, the area of blank space on the sides of the label, and the shape of the label. Measure the label carefully and input its width and length measurements and select the preferred printing orientation. Finally, select any background or template options that you would like to include on your label and select the 'Finish' button. Now that the label template has been completed, the basic shape and properties of the label or tag has been set. At this point, it is typically beneficial to associate a database of some kind to the tag in order to print a series of tags without manually changing the data after each print. This section will walk through the association of a Microsoft Excel database to BarTender, but the same steps can be applied for other database associations. First, select the Database Connection Setup icon, which is the fifth icon from the left of the toolbar, as can be seen in the image below. This will open the Database Connection Wizard's information page, so navigate to the next page and select the Microsoft Excel OLE DB option and select 'Next'. Browse your computer for the Excel database and select 'Next' once it has been chosen. On the next screen, select the Excel table to be used for the database and select 'Finish'. Now the database has been associated to your template. Now that the template has been made and is connected to a database, it is time to design the look and functionality of your label or tag. To add text to the template, select the Text icon in the top toolbar, which is a large capital A. The resulting drop-down menu allows for the selection of either a single line or multiple line text entry. Simply select one of the options and click where you would like to place the text on the template. After the text object has been placed on the template, it is able to be resized and manipulated. When objects are added to the template, they need to be associated with the database in order to grab the data from it and relay it to the template. To do this, double-click on the object to open its Properties menu, which can be seen below. In the Type field, you will see Embedded Data, which will need to be changed in order to utilize the database. 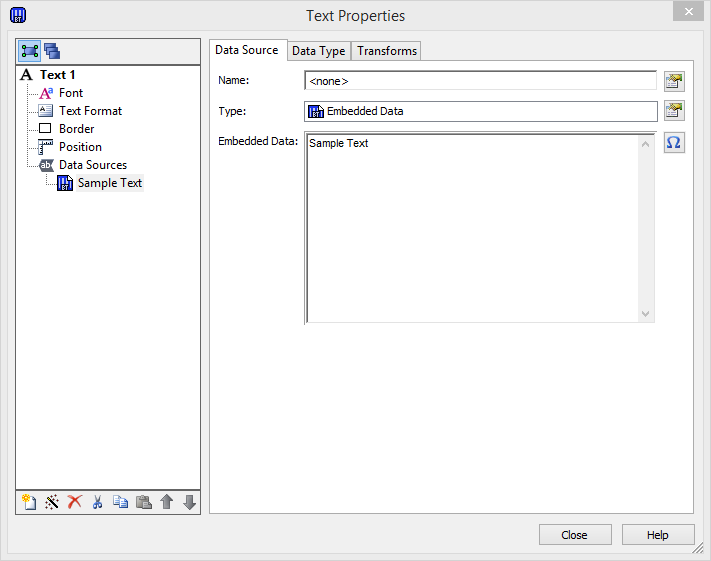 Select the 'Change Data Source Type' button to the right of the Type field and select the 'Database Field' option. On the resulting screen, select the database field to which the object should be associated and select 'Finish'. Alternatively, the Text object can be edited to show a specific text, without being tied to a database. After placing the Text object onto the tag template, simply select the text to edit it. The finished Text object should look similar to the one in the picture below. Bartender can also be used to add RFID objects to your tag template. This object allows for the encoding of the EPC (Electronic Product Code) of an RFID tag, which is the string of characters that is reported when an RFID tag is read. To add this object to the tag template, simply select the Encoder object (picture below) and select the EPC Gen 2 option. This will add the Encoder object to the template and open the object's Properties menu. Since EPCs are typically encoded in hexadecimal, change the Data Type to Hexadecimal. This will allow the EPC to be encoded with hexadecimal characters, which are alphanumeric characters 0-9 and A-F. EPCs are typically required to have at least 8 characters, and most can hold up to 24 characters, represented in multiples of four. For example, an EPC could be 8, 12, 16, 20, or 24 characters, and an 8-character EPC could be similar to 1234ABCD. To relate the Encoder object to a database, or to create a custom EPC, the same steps outlined in Adding Objects to the Template can be followed. The finished template should look similar to the one below. 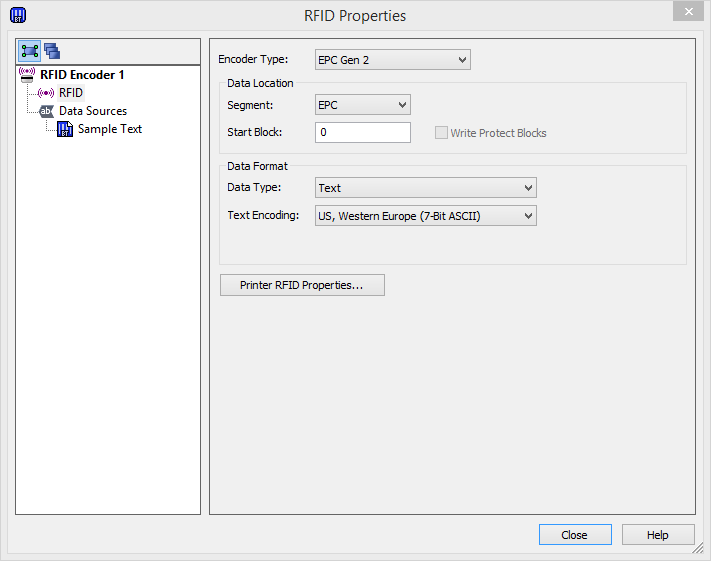 Additional EPC objects can be added in order to encode different RFID memory banks, such as User Memory, and additional text objects can be added to add multiple lines of text. Pictures and barcodes can be added using the same steps outlined above, and a database connection can be used to print series of tags in quick succession.